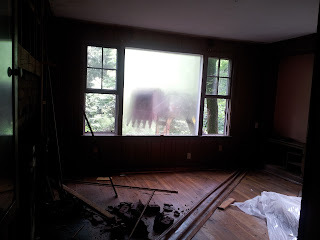 Eerie View....From inside the second story of an about-to-be-demolished home.....I left shortly thereafter. I don't usually get my kicks in this way........The operator knew I was in the home by the way. We were in total communication........ It is not the way I want to go. Demolition of the Georgia Dome? Is this what is destined for the Georgia Dome? Couldn't they re-use the Dome as a movie studio? I'll try and remember to email City Council members with the suggestion! What is the tolerance zone? • Do not use picks or mattocks. • When using a shovel, keep face of blade parallel to and pointing away from the "flag line." • When using posthole diggers, keep the opening between blades pointing in the same direction as the utility lines. • In hard compacted soils, pothole to the side of the locate marks and collapse the soil into the hole while digging towards the marks. Don't Forget: "Call Before You Dig"
Before beginning any large project which requires digging in Georgia, remember to call Georgia 811, a division of the Utilities Protection Center, Inc.
Georgia Public Service Commission regulates these projects in the state, and works to minimize any destruction to public utilities. If you are planning on any digging in close proximity to homes, underground utilities or overhead high voltage power lines, you are required to call 811 to alert the utility providers of your project. The utility providers will visit the project site to mark the utilities located within the dig site. This is to ensure that no damage is done to the conduits for these utilities. For further information, visit http://www.georgia811.com/.